Although technological and concrete creations which cause death and sickness are described as ‘development’, the expectation of the whole world today is development which ensures sustainability of the environment, President Maithripala Sirisena said. Although in the last 20 to 25 years the majority of heads of states, politicians, intellectuals and experts were not concerned about environmental protection, the whole world is at present engaged in dialogue on this subject, because environmental destruction has become a challenging and decisive problem threatening human existence, he said. As such the current responsibility towards the protection of the environment cannot be dismissed lightly, the President said, speaking at the Environment Pilot Presidential Medal awards (Parisara Niyamu Janadhipathi Padakkam Pradanothsavaya) ceremony held at President’s House in Colombo on Wednesday. The President’s Media Unit in a statement said this awards programme was intended to build an environment-conscious future generation by providing environmental education through schools and practically introducing students to environmental protection. 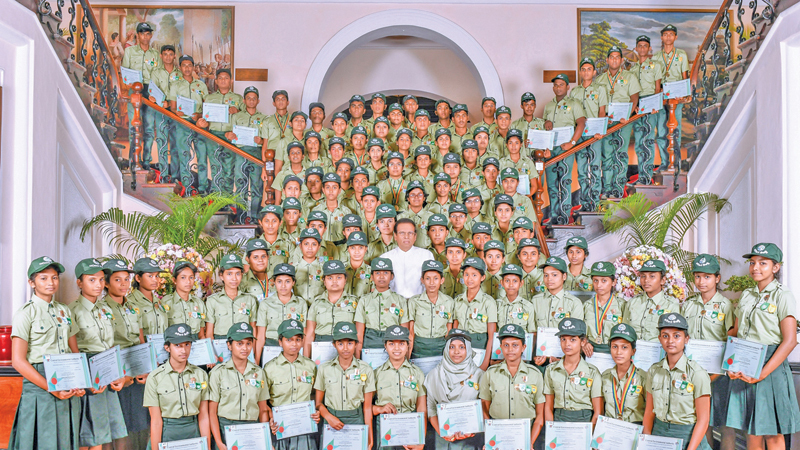 The Environment Pilot programme occupied a foremost place in the Neela Haritha Yugayak (verdant era) programme introduced by President Sirisena in his capacity as Environment Minister. This five-year programme is aimed at transforming the four million schoolchildren into environment-friendly citizens. A student Environment Pilot who wins a Presidential medal is entitled to four additional marks for subject-related extracurricular activities at the university entrance. At the Presidential Medal awards ceremony held for the eighth time on Wednesday, a batch of 93 Environment Pilots belonging to 40 schools received Presidential medals, since this is a programme aimed at introducing students to practical implementation of environmental knowledge, without restricting it to mere book knowledge. The President emphasised the need to implement this programme in all schools, to the officials present. Education Minister Akila Viraj Kariyawasam, Environment Deputy Minister Ajith Mannapperuma, Central Environmental Authority Chairman A.J.M. Muzammil and CEA Director General Hemantha Jayasinghe were also present on the occasion.